1. Soak the gelatine in some cold water and set aside. 2. Put the cream and sugar in a small saucepan and bring to the boil. Remove from the heat, then add the lemon zest and juice and stir. Bring back up to the boil and remove from the heat. 3. Add the soaked gelatine and stir well. Strain through a fine sieve into a small bowl. Cover the bowl with cling film and leave to set in the fridge overnight. 4. Remove the lemon posset from the fridge and whisk until it forms stiff peaks. Place into a piping bag and refrigerate until required. When you’re ready to make the macaroons, preheat the oven to 130°C, gas mark 2. Line two baking sheets with baking parchment. 5. For the Italian meringue, place the sugar and 75ml water in a small saucepan and stir. Place a sugar thermometer in the pan and put over a high heat. 6. Place the egg whites in a separate bowl. Once the sugar syrup reaches 110°C, start whisking the egg whites (either using electric beaters or in a freestanding mixer) on a medium speed. 7. Once the temperature has reached 114°C, (at which point the eggs should be frothy rather than whipped), remove the thermometer and quickly pour the syrup into the egg whites, turning the beaters up to the highest setting. Beat at full speed for 5 minutes, until you have a glossy and whipped Italian meringue that holds its shape. 8. In a separate large bowl, make the almond paste: combine the ground almonds and icing sugar. Add the remaining 65g egg whites and mix with a wooden spoon until a stiff paste has formed. Weigh the paste and divide equally between two bowls. Add the red food colour to one bowl, and the yellow food colour to the other bowl. Stir until the colour is mixed evenly. 9. Now the meringue will be ready. Weigh the meringue, and divide in half. Now you need to combine the meringue and paste; this is done in three stages. Add the first third of the meringue to the bowl with the paste and mix well with a wooden spoon. With a spatula, fold another third of the meringue gently into the paste, then fold the final third in extremely gently. You should have two mixtures now, one pink, and one yellow. 10. Carefully fill piping bags with the mixture and snip 1-2cm from the end. Lift the parchment paper and pipe small dots of the mixture into each corner of the trays, then smooth the parchment back onto the tray, so it sticks down well. Holding the piping bag directly above the trays, pipe macaroons about 4cm in diameter, leaving a 2cm gap between each. Bake in the pre-heated oven for 10-12 minutes. 11. Carefully check the macaroons are ready by gently easing them away from the paper. Don’t worry if they are a little bit sticky when they come away, but if they are very sticky then return to the oven for 2 more minutes. Cool on the trays. 12. 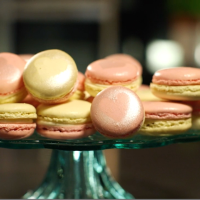 To assemble the macaroons, arrange the cooked shells in columns, matching the sizes. Pipe the whipped lemon posset in the centre of each shell and then pipe a small dot of raspberry jam in the centre. Sandwich together with its partner and decorate with silver shimmer spray. Store the macaroons in an airtight container and keep in a cool place — avoid storing in the fridge. Consume within 2 days. They will also freeze well for up to a month, wrapped in cling film.